They'll remember your kindness every time they reach for a cookie inside this holly jolly cookie jar, painted with a festive holiday motif, a high gloss finish and vacuum-sealed bamboo lid. With your personalization engraved on the lid, it's a holiday gift they'll love to display year after year. One Ceramic Holiday Cookie Jar with Engraved Bamboo Lid. Sixteen Cookies in Classic Flavors - Chocolate Chunk, Cranberry Oatmeal, Frosted Shortbread and more. Your gift is securely wrapped to safeguard the shipping process. A complimentary card with your personal message is included with your gift. One line, up to 10 characters can be engraved on the cookie jar lid. Enter information to be embossed during the checkout phase of the ordering process. Personalized Happy Holidays Cookie Jar and Cookies is a hand delivered gift. These gifts are delivered by one of our local design centers located throughout the United States and Canada. Same day delivery is available for most gifts when ordered before the cutoff time. 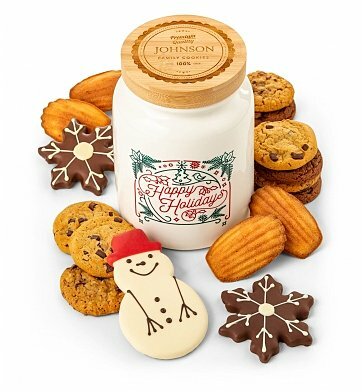 The cutoff time for Personalized Happy Holidays Cookie Jar and Cookies is in the recipient's time zone. Frosted Snowman CookieA luscious shortbread cookie is enrobed in chocolate and hand-decorated with a sweetly-frosted snowman design. 3 oz. Send sweet wishes for the holidays!